On Saturday, May 19, 2018, 700 people including Higo Bank Group’s experts, local citizens, and agricultural faculty students of Tokai University participated and carried out the 8th rice planting in “Aso Fountain rice terraces”. Although we were afraid for the rain from the previous day, the weather has improved drastically as was forecasted by the Japan Weather Association. Executive Director Ohono gave greetings to encourage their works for the staff who gathered at Apika Agricultural Park from the early morning. 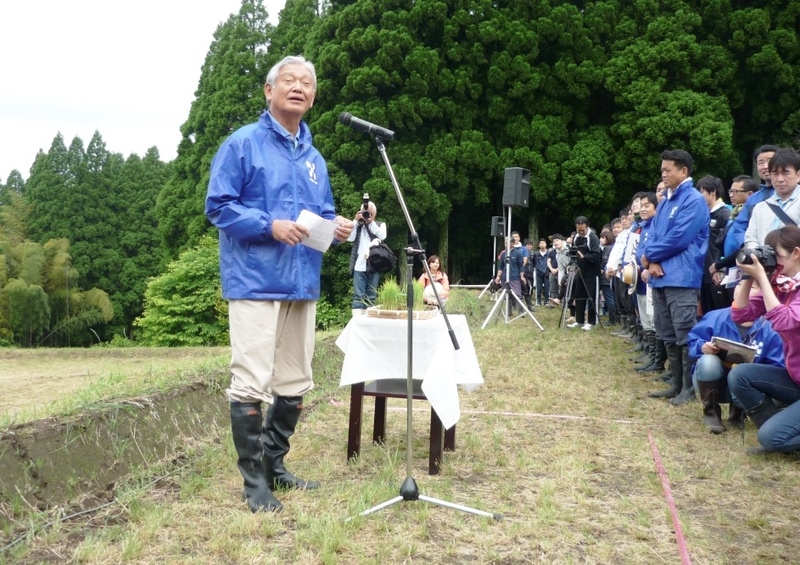 In the ceremony, President Kai told us that “There was a highest harvest record last year” and “The activities and resulted landscape of Aso Fountain Rice Terraces has been highly evaluated and Landscape Award of Green and Water was given from Mr. Kabashima of Kumamoto Prefecture Governor”. 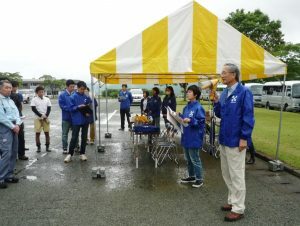 He also talked that “I asked Japan Meteorological Agency to lecture this year ‘s environmental course of our foundation”. 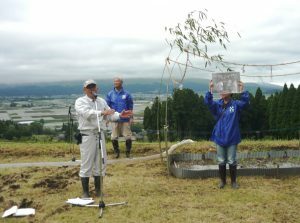 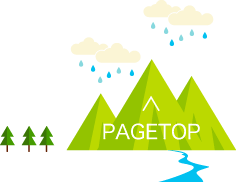 Finally, he said that we plan to go and see the source of the Otogogawa spring today. 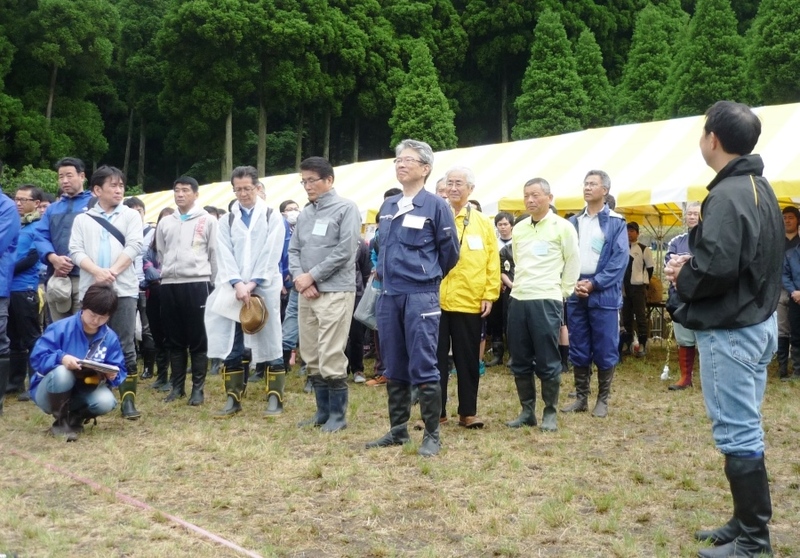 Guest greetings were received from Mr. Fukushima, Director of the Agriculture, Forestry and Fisheries Division of Kumamoto (central right side) and from deputy mayor of Aso city (center left side). 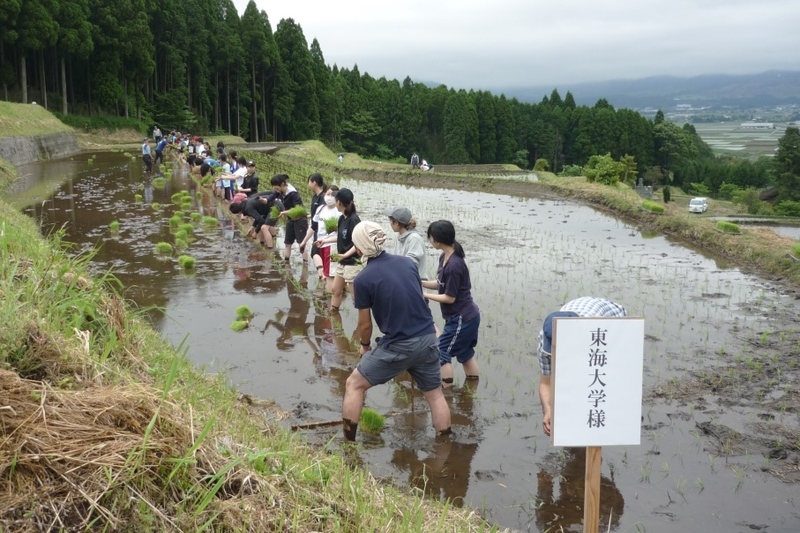 Then we did a “rice planting ceremony”. 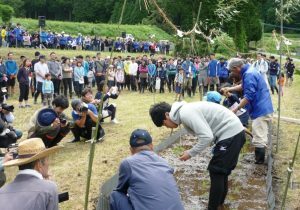 In addition to the caution during the rice planting, Mr. Kawazu of our foundation ‘s director introduced us that “ Mr.Yusei Nakanishi who participated in the first rice planting ceremony of the year 2011 as the Yamada elementary school’s sixth graders student, is now became Sumo wrestler belonging to Sakaekawa team and actively battled as the 2nd wrestler rank step”. The board hanged on his right side is a picture of the ritual ceremony at that time. He does not have funko (wrestler name) yet, but we hope to cheer his great success. After the ceremony, joined members are divided into several groups and rice planting has started. The Join of Agricultural faculty students of Tokai University has become a regular custom. 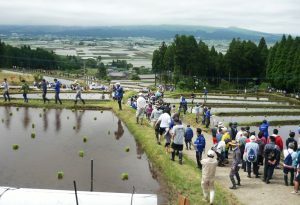 The rice planting ended successfully, and it goes into the lunch time. This time became a colorful scene with yellow and white tents. 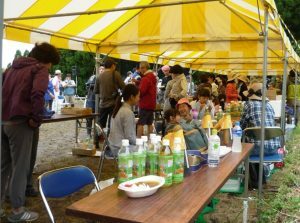 After eating curry and rice prepared by the local women’s association, everybody enjoy their rest time before the departure of buses to Apika park. 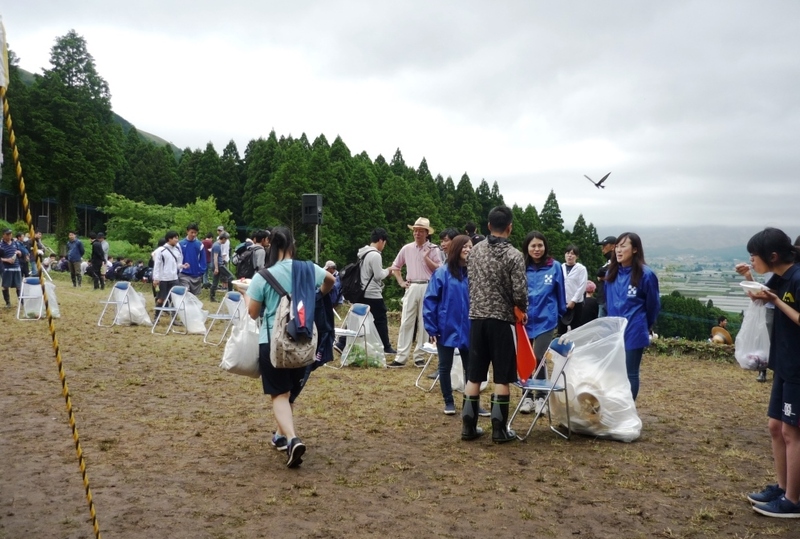 A large bird like a hawk was flying over us elegantly. 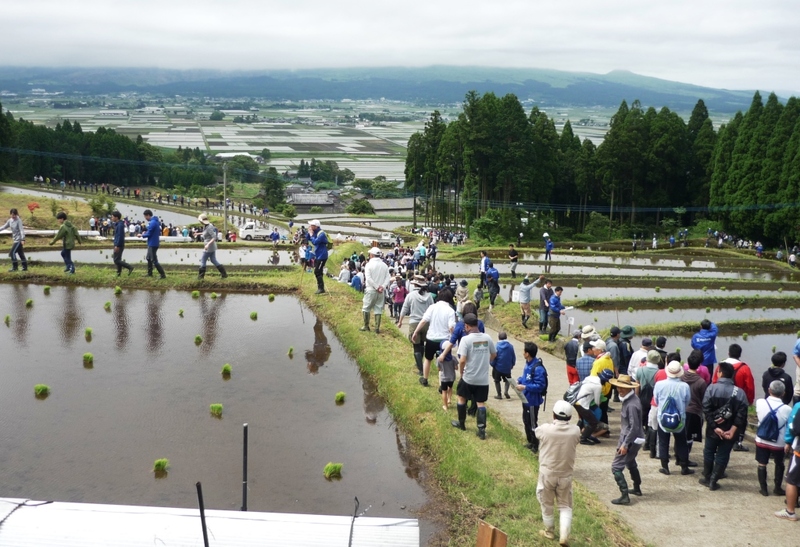 We went home hoping to contribute to the groundwater recharge by our rice planting in “Aso Fountain rice terraces” of this year, and also wishing good harvest of “Akigesiki” seedlings in autumn.